The buoyancy of water can reduce your weight by as much as 90 percent, according to the American Council on Exercise. This means that stress on weight-bearing bones, joints and muscles is reduced, resulting in fewer injuries or sore muscles. Despite this, a water workouts can provide plenty of benefits, encompassing cardiovascular fitness, increased flexibility and muscular strength training to reduce body fat. Deep-water aerobics reduces the heart rate by as much as 17 beats per minute compared to land exercises, according to the American Council on Exercise. Because of your reduced heart rate, your body might think it isn’t working very hard, when in fact you are getting a strenuous workout. The low-impact exercises in deep-water aerobics is useful for those who find movements on land, such as kicking, running or dancing, too jarring or painful. 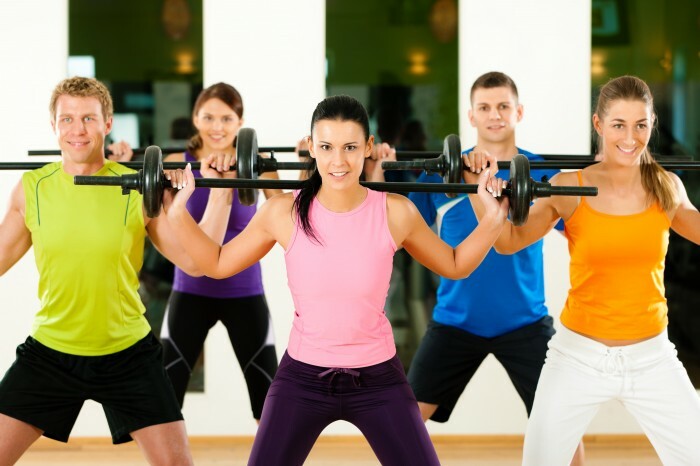 Resistance training adds muscle mass, which in turn burns more calories. The resistance of the water acts as weight, similar to a strength-training workout. An easy way to increase the resistance of the water is to cup your hands, pushing or pulling the water away from you. You can also use hand-held paddles or water chutes to provide a more intense workout. The buoyancy of the water helps your body perform stretches it might not be able to do on land. Thanks to this decrease in gravity, your joints will be able to move through more motions to achieve long-term flexibility. Thanks to the water’s buoyancy, water aerobics can be performed no matter your age. This decrease in gravity causes less stress on your joints and muscles, which is particularly important for the elderly, who may suffer from arthritis or joint pain. Water aerobics is non-weightbearing, so the water, not your lower body, supports your weight and you are allowed to work all of your muscles and joints at the same time. The water provides resistance in all directions to help strengthen and rehabilitate muscles and joints that may have been injured. Because you are not placing your weight on your lower body, and the water is holding you up, this low-contact exercise won’t re-injure you and it can help your current injuries heal. Deep-water aerobics can be conformed to suit your injury by simply adjusting the size and speed of your movements. Water aerobics helps you burn calories more efficiently than traditional exercise. According to Diabetic Lifestyle.com, during a 30-minute workout, you will burn 135 calories by walking on land and 264 calories with deep-water walking. Why not try our Aqua Bootcamp – Tuesdays 12:05pm -12:45pm at the Eau Claire YMCA. Please call 403-781-1684 or visit www.ymcacalgary.ca for more information. 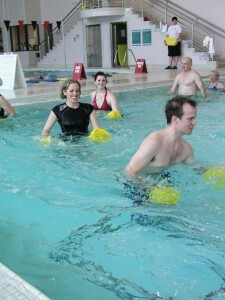 Aqua bootcamp uses the Aqualogics equipment to create additional resistance for both arms and legs. A great addition for any fitness level! Eau Claire YMCA has the right program for you! Let us help you keep your promises for a healthier 2013. Yoga, Fusion and Zumba are just a few of the more than twenty programs being offered at Eau Claire YMCA! Come try one of our Aqua boot camps being offered on Mondays and Fridays at noon. Remember YMCA rolling registration lets you always be on time. Registration continues after programs have begun and fees are adjusted accordingly. A body in motion is always headed in the right direction. Call 403-781-1684 for more information or to register .